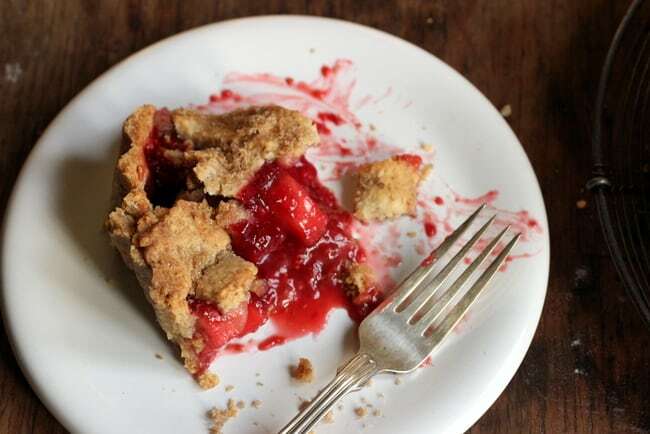 A crostata is basically Italian for pie, so this is technically a raspberry apple pie. It sounds cool, doesn’t it? In spanish it makes us think of crusty, a crunchy top, which is exactly what you get from a good lattice pie, or the bits of cheese that have melted and almost burned in a pan. But the former is what we’ll talk about today. 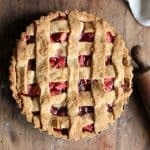 I should’ve started making this pie yesterday and letting it cool completely, even refrigerate it for a few hours, before cutting it, but hey, there were pictures to be taken and a post to be scheduled. 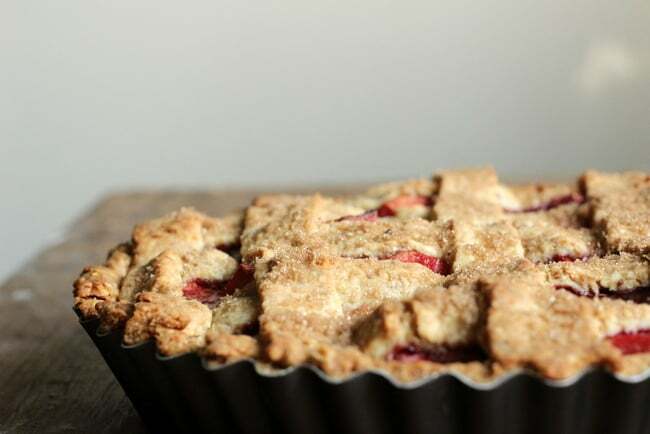 A food blogger’s daily issues, having to eat this raspberry apple crostata still warm. Tough day. 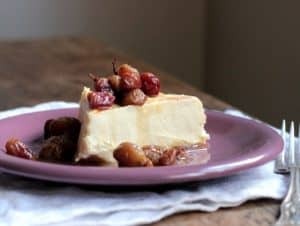 The original recipe for today’s Tuesdays with Dorie challenge called for fresh figs, but of course a month ago they were everywhere, this week not a single fig remained in the market. After having some of the best strawberries in the middle of winter, I’m probably expecting too much, huh? Well, last month was also winter, yet there they were waiting, the fresh figs. See? Sometimes restraining myself instead of hoarding is not positive. After deliberating whether to use dried and candied figs instead of the fresh ones, I simply peeled the pound of apples lying in my fruit basket, leftovers from apple crumb bars I made for my neighbour’s birthday. It feels good to use what’s lying around and not keep on buying, said the hoarder. Sometimes I surprise even myself. The part that really drew me to this raspberry apple crostata or lattice pie, besides the fact that it’s a recipe from Leslie Mackie, of Macrina fame, a superb baker whose upside down pear ginger cake I’ve made numerous times and consider one of the best cakes I ever had – a recipe I now realize I should post, no doubt – is the toasted almonds and sesame seeds in the dough. 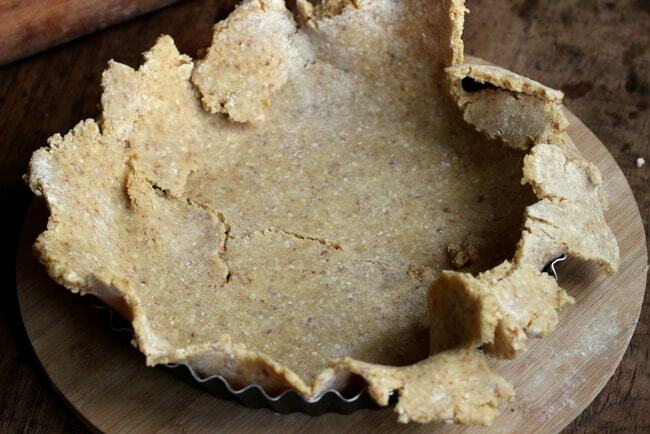 The idea of crunch and seeds in pie dough is simply glorious. 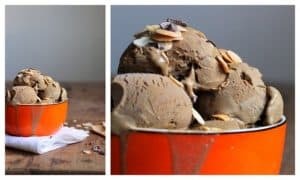 Though the regular sweet tart dough and graham cracker dough have a secure seat at my kitchen theater, this one talked of subtle flavors uniting into one interesting bite. I made it in the food processor from beginning to end, like I do with all doughs. It comes together in a few minutes; it takes more to toast and measure the ingredients. And like all pie doughs, it has to be admitted to the refrigerator before rolling it and fitting into the pan. It has to do with using all butter and letting the dough relax after the stress of being swirled in the processor. And it turned out to be slightly crumbly, like a peanut butter cookie dough sometimes is. But no biggie, just patch up if it breaks while trying to fit it into the pie plate. You won’t have to use pie weights, or pre-bake it, so there will be no shrinking of the dough. The whole thing is assembled with the raw dough and the cooked ruby colored filling, and then chilled before going into the oven. What else can I tell you about this crostata? Oh yes, it’s as good as it looks. So I hope it looks good. 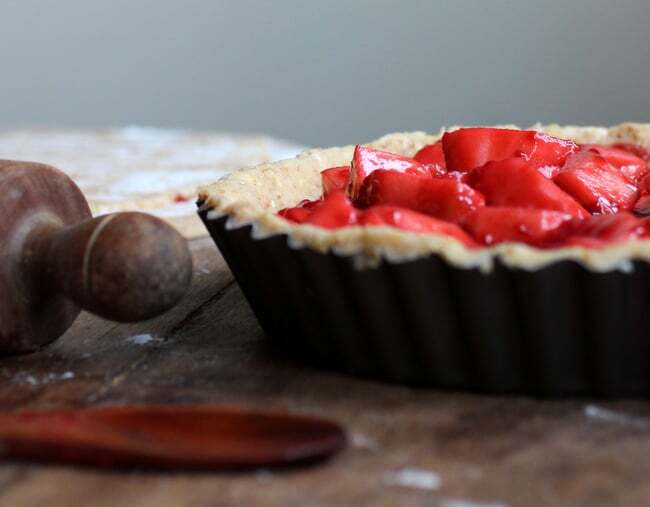 I have a rustic idea about lattice pies the same way I do for galettes, like this strawberry one. I don’t mind if there are uneven strips of dough on top, just like I don’t mind what shape the gallete sides have. Whatever way your strips look, fine. 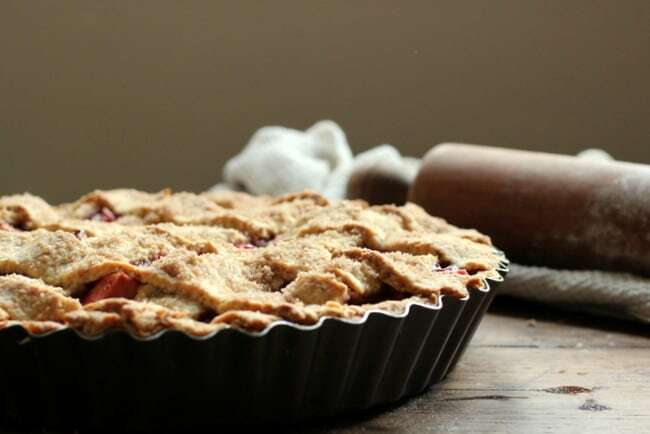 Unless you’re a neurotic nelly and want to spend time cutting perfect strips and refrigerating them for just the right amount of time so they don’t get too cold that they brake, but cold enough so they lie in perfect lines on top of the still warm raspberry apple filling. If that didn’t scare you, go for it. Go ahead and make perfect strips. A sprinkling of confectioners’ sugar on top is a great way to end this crostata. I didn’t do it here because it was warm, remember? Lightly toast seeds and almonds, being careful not to burn them. Let them cool. Put both in the bowl of a food processor fitted with the steel blade, and add 1 tablespoon of the sugar. Process until medium ground. Add the rest of the sugar, flour, cinnamon and salt and process until well blended. Scatter cold, diced butter on top and process until it looks like coarse sand. Mix eggs in a bowl with the vanilla and add to the flour mixture. Process until it starts to come together, about 10 to 15 seconds. Don’t let it turn into a ball. Gather into a ball, wrap in plastic and refrigerate for 1 hour or more. 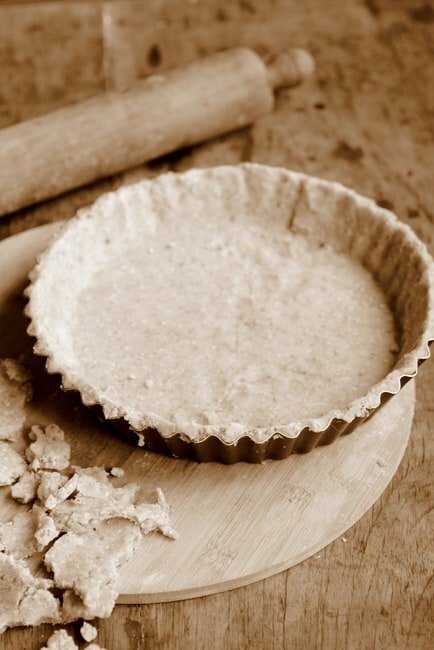 When you have the filling cooling, divide the dough into two uneven pieces (2/3 and 1/3). 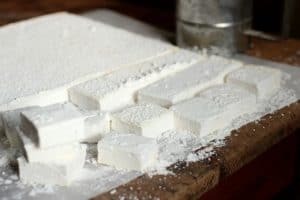 Roll the large piece, using additional flour to prevent sticking. Transfer to a 8-inch (24cm) pie plate, with removable bottom is best. Without stretching it, make it fit into the pan, removing excess dough. Add the filling. Roll the small piece of dough on a lightly floured surface and cut strips with a pizza cutter. 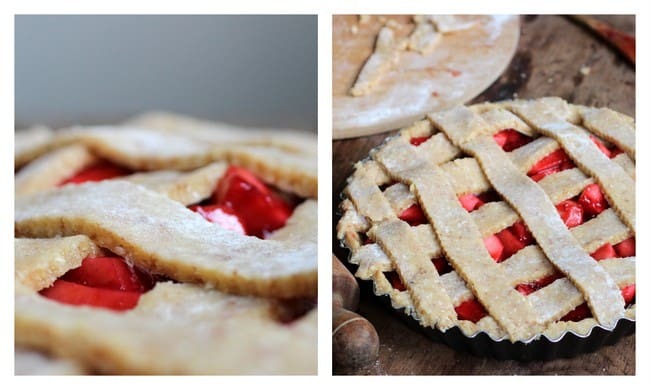 Make a lattice over the filling, adding strips one way and then the other. Press where the strips meet the bottom dough to adhere. Refrigerate for 30 minutes. About 15 minutes before baking, preheat oven to 350º. Sprinkle a few tablespoons of extra sugar on top of the lattice, and bake pie for about 40 minutes, until golden and the filling is bubbly. Let cool on wire rack. Refrigerate leftovers. 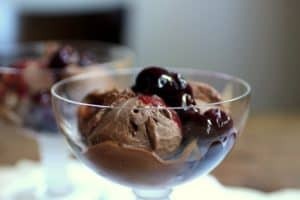 In a large saucepan, put all filling ingredients and cook over low heat until butter melts and fruit begins to release their juices, about 5 minutes. As soon as it bubbles remove from heat. If not using immediately, keep refrigerated for a few days. Oh you poor dear having to sample this pie while it was still warm. I can help you out if you like! I love that you adapted the filling to use up the fruit you had to hand. Delicious! 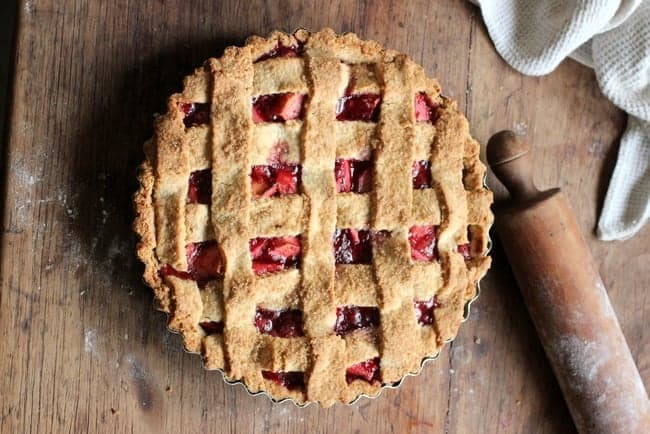 This crostata looks wonderful and if it tastes anything like it looks, I want one. 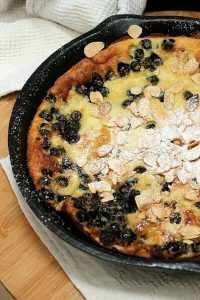 A very beautiful rustic tart, Paula. I wouldn't need any icing sugar on top either. The pie is lovely indeed and that crumbly texture sounds good to me. Sounds and looks absolutely delicious, Paula. I'd say it might even be better still warm! Great minds think alike with the flavours 🙂 Yours looks wonderful! We ate ours cold which was good but I wish I had also eaten some while it was still hot, it would have been magnificent with some cinnamon ice cream melting over the top! It looks lovely! I thought the dough on this was really interesting and delicious. The dough was an interesting combination. I loved the earthiness flavor it had. It is a great feeling to use up what is on hand – does not happen here often enough! Beautiful photos. Oh, boy, your raspberries provide a magnificent color! Beautiful tweak!!! That looks lush. Just lovely Paula. And your right, sometimes we have to suffer for our art. 🙂 Someone has to do it! 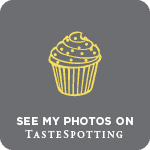 Sigh, the things food bloggers are forced to do, right Paula? 😉 Lol. There have been many times when I've plated something that isn't anywhere near serving just because I need to photograph and blog about it (usually because I'm rushing at the last minute for Sunday Supper posts!). 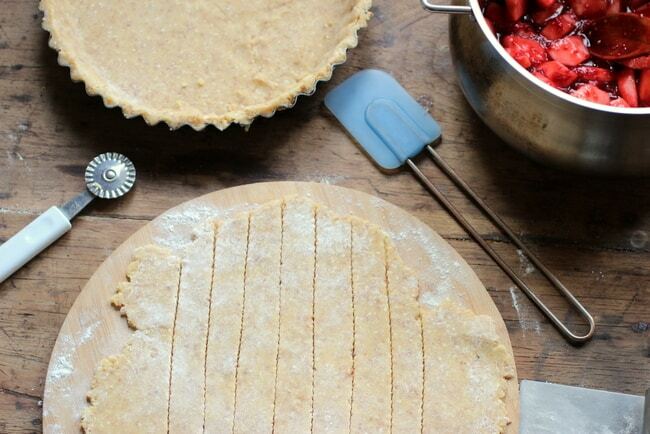 Your crostata looks glorious – crispy, crunchy, fruity perfection. I'm glad that you don't have a "perfect" lattice top – it looks amazing as is. Your raspberry apple version looks delicious. I loved the dough for this one – it was so unique. What a scrumptious post! 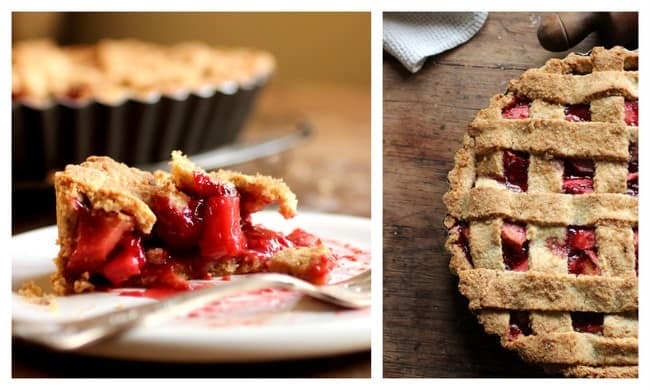 From the aromatic filling to the stunning crust and splendid photos, I adore this crostata! I'd love to see the recipe for the upside-down pear ginger cake. It sounds incredible! I really liked this crust, too. More complex than most, in the best way. oh my gosh, I soooo need these! 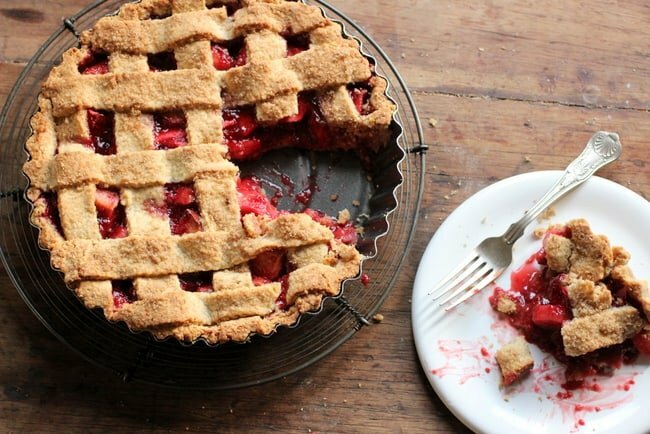 Oh wow, that's a beautiful and vibrant looking crostata! I love the raspberry and apple combination. Can I have a slice with my coffee please? 😉 Gorgeous! beautifully rustic- I love it! and good idea to swap the figs for apples. I bet it was really tasty!